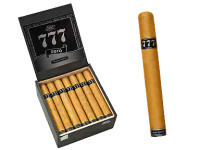 One of master blender Jesus Fuego‘s most popular lines, the 777* Zero series features fillers of Nicaraguan corojo and criollo and a Nicaraguan corojo binder, encased in a smooth wrapper of Ecuadorian Connecticut…an extremely satisfying blend, mild with a little bit of muscle. This unusual combination produces a creamy almond/walnut flavor and a mild, fruity sweetness that evolves gradually as you smoke. This week’s pick is the 6″ x 52 toro, a perfect cigar to enjoy with your morning coffee. Get ’em while you can!